Bekijk gerelateerde producten mét startdata: Leiderschap. Bestselling author Hamid Safaei will share his knowledge about leadership with you by offering the training Premium Leadership Qualities. As a professional, leader, entrepreneur, or manager you may wonder: How come that millions of people struggle to survive the day while a few can change the world, write history, and shape our future? The likes of Steve Jobs, Bill Gates, Oprah Winfrey, Jack Ma, and Elon Musk can build multi-billion dollar companies, while millions have to beg for a simple job to be able to pay their bills and to have a rented roof over their head. Why is that? Why can college drop-outs like Mark Zuckerberg change the world, while plenty of PhD, and MBA holders just earn enough to live a quiet life? What is the secret? The renowned executive coach and two times international bestselling author of multiple books incl. First-Class Leadership, Hamid Safaei, had the same questions. Next to two decades working with leaders, he spent 5000 hours to find out what the greatest leaders and entrepreneurs on the planet have in common. What do they do daily and what do they avoid at all costs? What qualities make or break us? And how can YOU walk in the footsteps of giants? 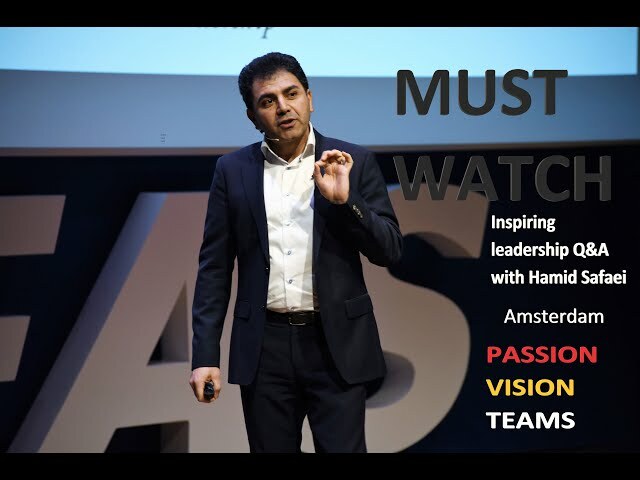 Hamid Safaei is pleased to share his knowledge with you by offering the training Premium Leadership Qualities, your ticket to extraordinary wealth and ultimate peak performance. Premium Leadership Qualities training is more Than Just Leadership. That’s because you can use the same algorithms learned in this training to grow all kinds of businesses to the next level. For example, Hamid himself has used the same algorithms to connect and work with world leaders and Global Fortune 500 CEOs. Renowned professors have written to Hamid saying things like: “I wish this book had been available 10 years ago.”; “As of now I have added this book to the reading list for my students.” One even said: “This is not just a great manual on leadership but on life in general”. 8 premium leadership qualities that help you make a name for yourself… no matter who you are or what your background is: black, white, religious, atheist, rich or poor, none of these matters. What does matter is that you have the right key to open certain doors. Hamid gives countless examples of people from all walks of life and from different cultures to show that you can do it as well. Join Premium Leadership Qualities to learn what you need to master and how you can become one of the top 0.1% of leaders who are remembered forever. What is the very first thing that real First-Class Leaders master? Do you really love what you do? What if you keep doing what you don’t love to do? What if you don’t have a clue about your passion? Aristoteles said one virtue makes all other virtues possible. You’re right this is a leadership quality that makes other qualities work. Which one does Aristoteles mean? Can you really make your breakthrough by applying just one quality? Even if you’ve failed your whole life? Hamid will share this with you in this training. “I’m busy” is what almost everybody says these days. Learn why and, more importantly, what you can do to stop feeling busy all the time. What is the one quality that everyone needs to master in today’s spontaneous rapidly changing snap-chat world? Follow this training to find out why and how you can implement the algorithm of making fast calls. Not many managers succeed in real delegation and the majority struggle to put the right processes in place and end up busier than ever. Learn the algorithm of delegation in this training. We all want to rapidly grow our businesses. What are the secrets of multibillion companies that started in a basement 10 years ago? Why do many companies spend a fortune to attract top talents only to watch them walk away when they are about to pay off? How can you avoid this? What do highly effective team members have in common? That’s why your trainer, Hamid has learned how smart industry leaders make their toughest decisions in a fraction of a second. They know even before they are halfway through listening to a proposition if it is going to be a yes or no. And guess what, they say NO in over 80% of cases. That’s why they’re so ridiculously successful. Hamid spent 5000 hours to develop the simplest and yet most effective algorithms for leaders. All you need to do is follow the manual. When you apply the tools and techniques provided in this training, two things will happen. Hamid has set up this training using a combination of two decades of work experience with senior leaders, advanced NLP strategies, real life personal coaching with leaders and simplifying the timeless models that have been used by greatest leaders on earth. Yes, you heard that right. You won’t be the first ever leader to enter the unknown by following a step-by-step training on how to be the best leader. "Hamid is een inspirerend en gedreven leider met wereldvisie die anderen aanspoort hun paradigma te vergroten . "Ik ben geweest naar de Premium Leaderhip Qualities event en heb ontzettend veel kunnen opsteken. Hamid maakt zichzelf duidelijk, is een goeie trainer, weet waar hij over praat en geeft goeie antwoorden op vragen die worden gesteld. Ik raad het iedereen aan om een keer naar een event van Hamid Safaei te gaan. Het is een aardige, intelligente, goeie man die veel ervaring heeft en waar je zeker wat van kan leren. Ontwikkelt Finance door vanuit Finance bruggen te bouwen naar klantwaarde! "Hamid heeft mij inspiratie en inzicht gegeven. Mijn eigen drijfveren leren in te zetten om een goede leider te zijn en hopelijk ook inspirator voor de mensen waar ik mee samenwerk.